Talwar and Khanda, Assassins in Love and Saif’s Story collected in one single book. A Silvery Earth story about the birth of the Assassins’ Guild. The birth of the Assassins’ Guild of Godwalkar. Members of the Assassins’ Guild can be as honorable as anyone. They might be trained to kill, but they’re just people with loved ones to protect and avenge. 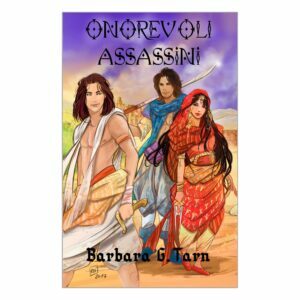 How two southern runaways found refuge in kingless Godwalkar and started and assassins’ school that trained the best, including Kilig the Sword. Cover art by Rossana Beretta.